IMBeR's main decision making body is its SSC. The SSC is responsible for providing scientific guidance and overseeing the development, planning and implementation of IMBER. The committee meets annually and decides upon policy and future research. 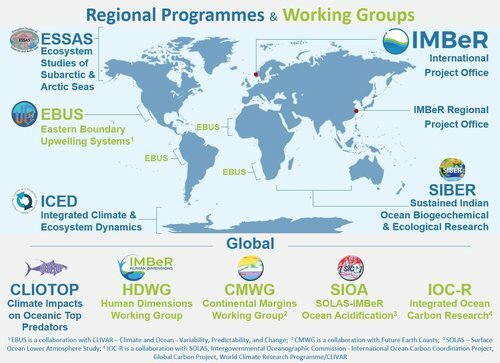 The International Project Office (IPO) provides day-to-day administrative support for IMBeR, supports all SSC activities and facilitates communication both within and outside the project. The Regional Project Office (RPO) was officially opened in March 2011 at the East China Normal University, Shanghai, China. In addition to assisting the IPO in its administrative and fund-raising tasks, the RPO will focus on promoting IMBeR activities in the Asia-Pacific region, facilitating IMBeR's Continental Margins activities and supporting the Capacity Building Working Group. 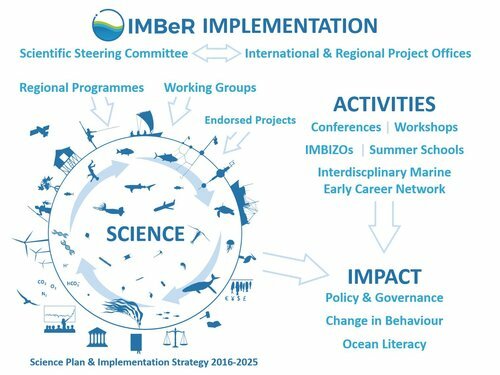 The implementation of IMBeR is facilitated by its working groups established to consider specific research topics. As well as the research programmes that are a mechanism for regional implementation of IMBeR research. Regional Programmes have their own implementation plans and they facilitate collaboration and communication between national and international projects.